The Ronco rotisserie oven is approximately the size of a toaster oven. Despite its size, you can create restaurant-style rotisserie chicken and ribs on your counter top. The next time you’re having guests for dinner, make some succulent, barbecue-flavored baby back ribs. The Ronco rotisserie oven comes equipped with special rotating kebab rods that will hold the ribs and other meat items as they turn inside the unit. Set a large pot of water under high heat on the stove and wait until it achieves a rolling boil. Put the ribs into the pot of boiling water and let them boil for 15 minutes. 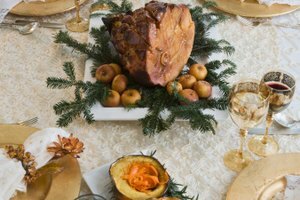 The boiling water tenderizes the meat so that it falls off the bone after cooking in the Ronco rotisserie. Pull out the ribs, set them on a clean work surface and season them with a dry rub or barbecue sauce. Insert the spit rods so they are in the rest area, just inside the door of the oven. Insert four kebab rods inside the rotisserie oven. 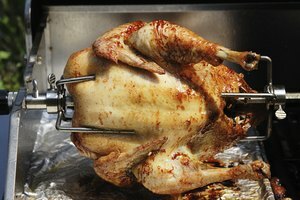 The spring ends should be positioned on the left side, and the rods should be placed in the holes around the wheel of the rotisserie. 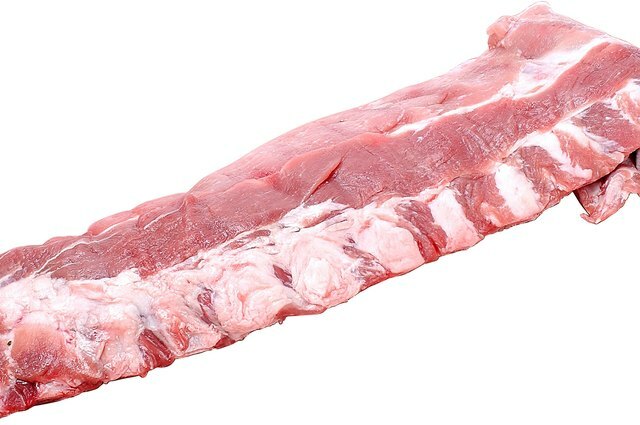 Grab a section of baby back ribs and insert the end of the first kebab rod through one side, behind the first bone on the slab. Take a second kebab rod and insert it through the other end of the slab, behind the last bone. Insert the two rods into the gear wheels on either side of the rotisserie oven. Wrap the rack of ribs around the four kebab rods that are already installed. Repeat, as necessary, for more racks of ribs. Shut the door of the oven and set the electronic timer for one hour. When the hour is up, check on your ribs. If they are not tender, cook them for an additional 30 minutes.